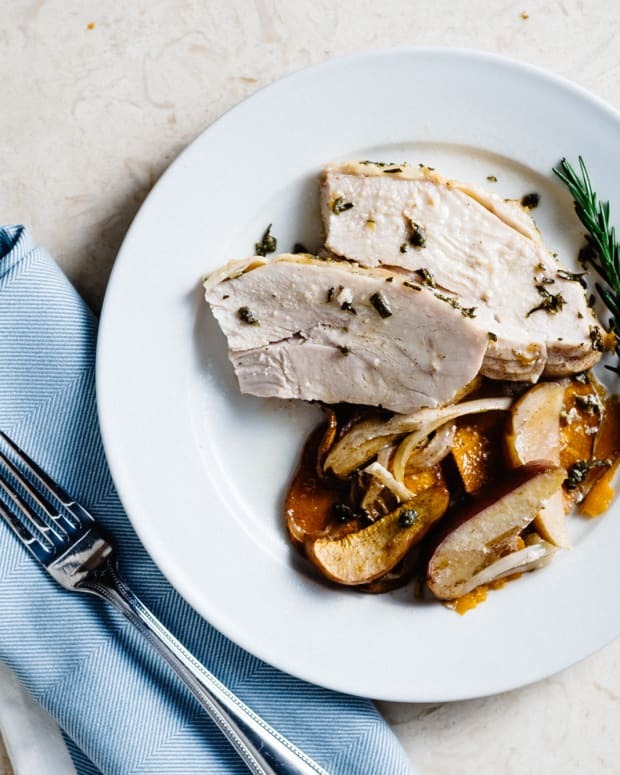 Sumptuous, mouthwatering herb-infused turkey is the star at Thanksgiving but this affordable main course is great year-round. Place the turkey on the bed of vegetables in the pan. Pat the skin dry. This will help ensure a crispy skin. 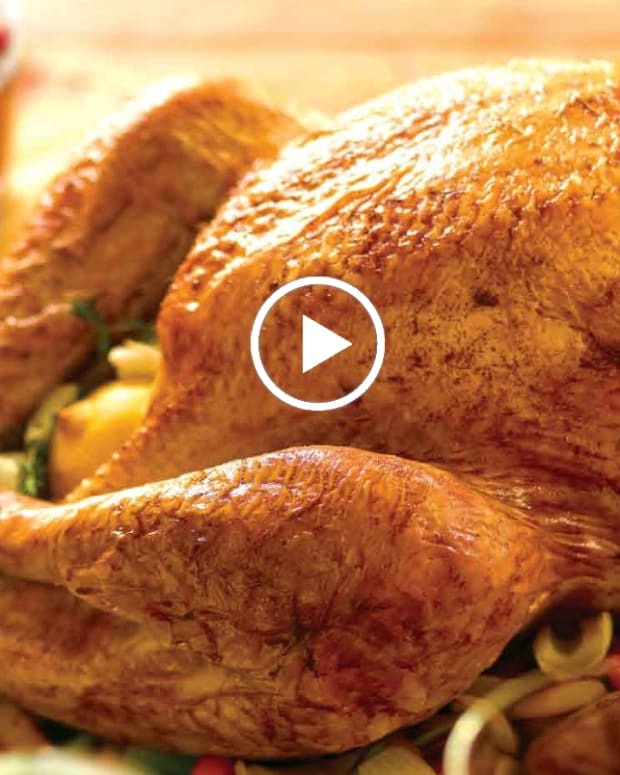 Run the turkey with olive oil inside and out all over. Salt and pepper the turkey inside and out. Place the oranges, bay leaves and onion halves inside the turkey. 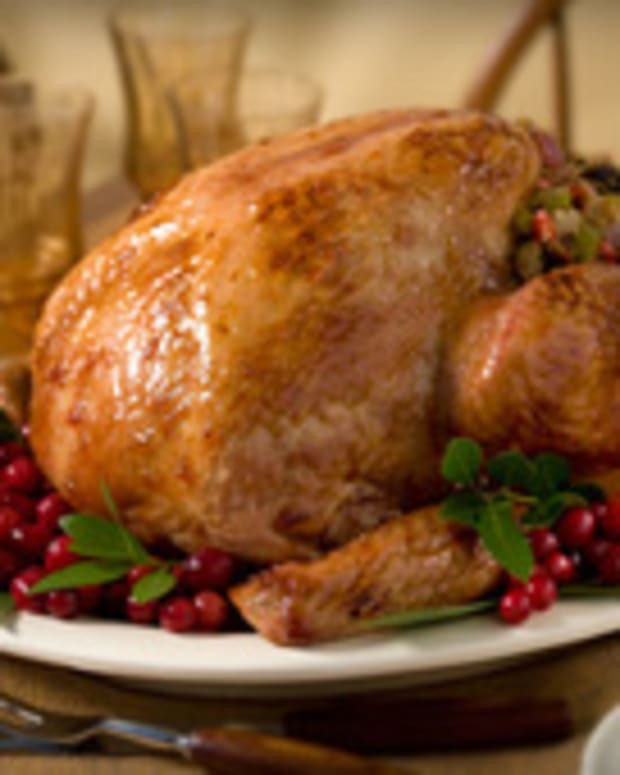 Position the turkey so the legs are facing you and the breast is facing upward. Cut a 3 foot long piece of butcher's twine. Loop the twine around the legs. Cross over the ends to form an X. Tie the legs together making sure to press the legs as close to the body as possible. Pull the ends of the string to the front of the turkey. Position the turkey so that the breast is again facing upward. Generously cover the turkey with the chopped herbs. I like to rub them all over the turkey, including under the skin. Place the turkey in the oven. Roast at 425 for 30 minutes. 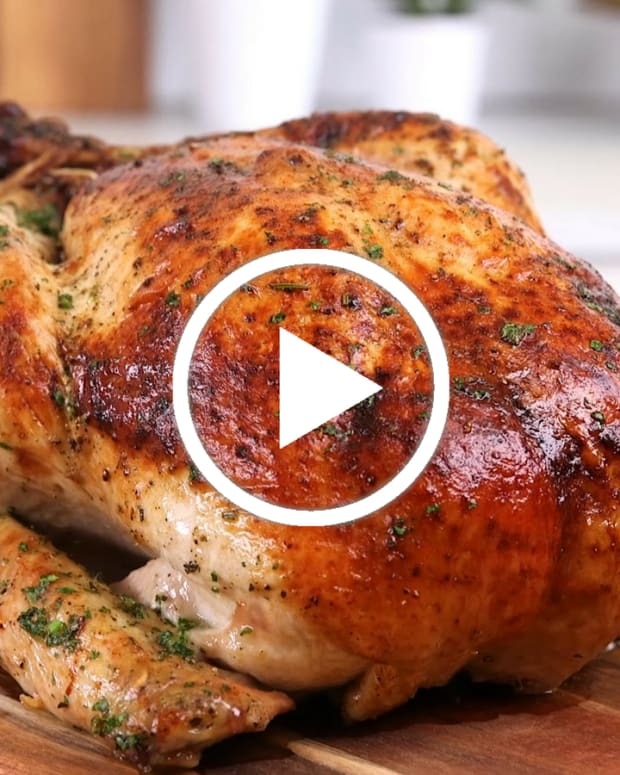 Turn down the oven to 325 and continue roasting until a thermometer inserted into the thigh registers 160 degrees F or the juices run clear when the thigh is pieced with a paring knife. 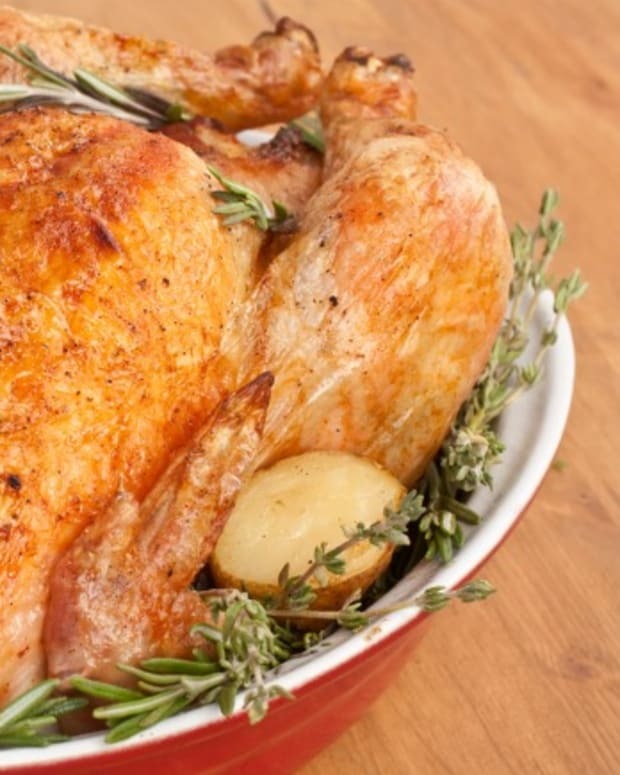 Remove the turkey from the oven and cover loosely with foil. Allow the turkey to rest for 20-30 minutes. Remove the turkey from the pan. Pour the pan juices, neck and giblets and vegetables through a strainer and SAVE the juices (you should a little over 2 cups). Allow the fat to rise the top and skim off and reserve. Cut the giblets into small dice. If your roasting pan can be put on a burner stove top, do so, and if not, place a large saucepan over medium heat. Place 1/4 cup of turkey fat from the cooking juices in the pan. Add 1/4 cup of flour and whisk together to form a loose paste (roux). Allow the roux to cook for about 2 minutes to remove the starchy flavor. Add 4 cups of pan juice to the pan. If you need extra liquid you can use the white wine and chicken stock. Add the vegetables, neck and giblet pieces to the gravy. Simmer the gravy over low heat. Adjust seasoning with salt and pepper. Before serving-strain out the vegetables. You can pick the meat off of the neck and add it back to the gravy. *All of these vegetables will keep the turkey from sitting in its own drippings and fat. They will also be the base for the most deeply flavored turkey gravy. If you have a very large roasting pan and need more vegetables, add more. **The whole point of tying the turkey in this manner is to form a tight "bundle". The turkey will hold it's shape better and this also keeps the breast from drying out. 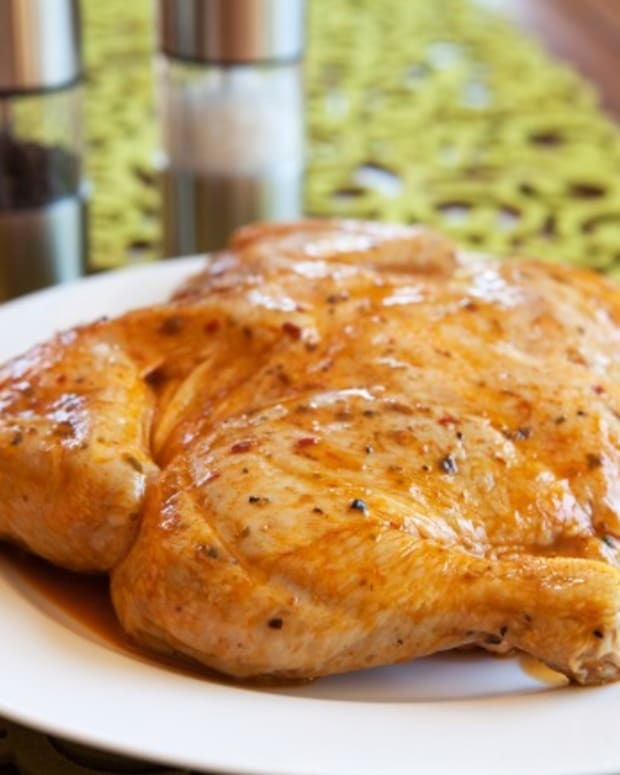 The legs tied close to the body protect the delicate breast meat and help to expose the slower cooking thighs. To carve the turkey like a pro: Place the cooled turkey on a large cutting board with the legs facing you and the breast facing upward. Drink a glass of wine! Remove the twine from the turkey. Cut the legs and thigh off of the turkey. You can probably do this with your hands, as the legs should be pretty loose from the long cooking session. Locate the breast bone. Using a sharp knife, slice a long cut along the breast bone. Work your knife down one side as close the turkey as possible. You are cutting each breast off of the turkey. Your knife should be touching bone on one side and breast meat on the other. Once you remove the breasts, slice the breast into thin slices and layer on a platter. Save the carcass. There is flavor in them bones. Freeze your carcass for some great turkey chowder later in the fall or winter (recipe coming soon). I am not a fanatic for the gadgets of turkey roasting. I do not insist on V-shaped racks or other once a year tools. All you need is a pan that can easily accommodate the turkey, some butcher's twine and a good bird. I think I can taste the difference between an organic bird and one that is not. If you can find an organic turkey, go for it. I think it has a clean, "turkey-ier" flavor. I also know that I feel better knowing that the turkey ate organic food and was raised in an environmentally-friendly way. 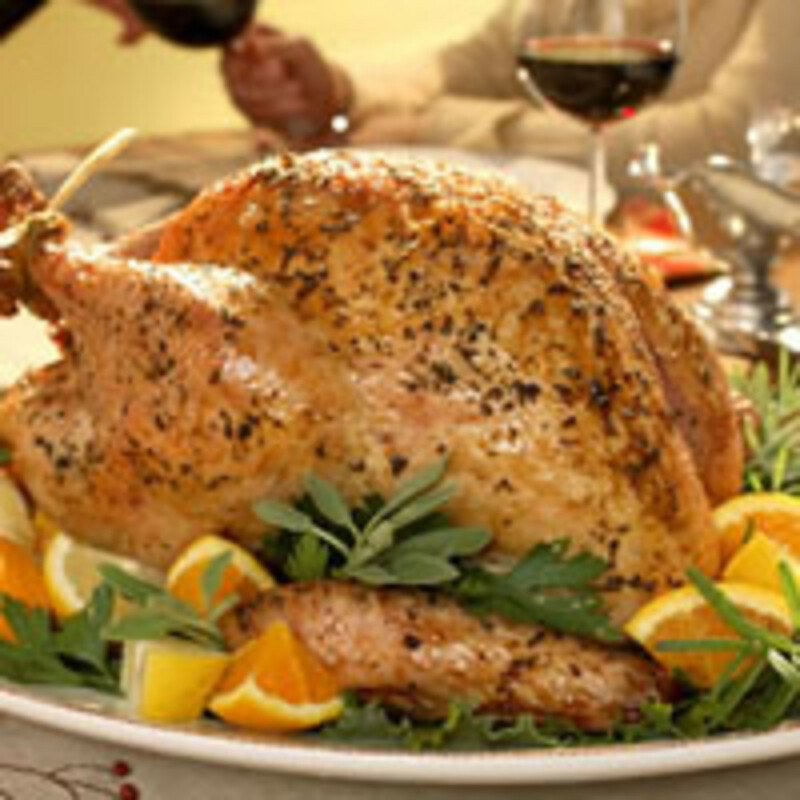 Kosher turkeys do not need to be brined. The kashering process of salting and soaking already brined the bird. Skip that step and move on. Pat yourself on the back for one less step—Go Kosher!